Last week was a busy, tiring but good week. 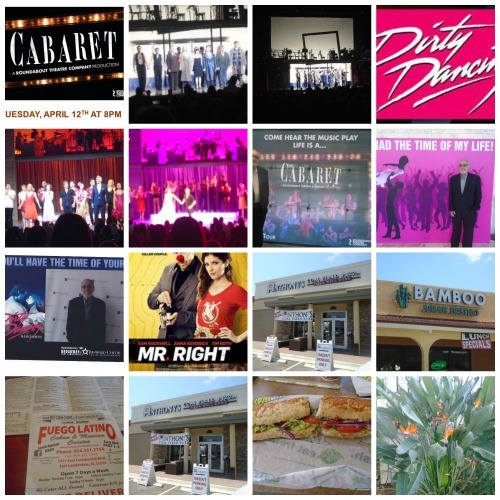 We went to see the touring stage production of “Cabaret”, a show that I hadn’t seen in 50 years, and the night before a new show, the stage adaptation of the movie “Dirty Dancing”. Wrote and posted the reviews late the night of the show or early in the morning. Also did my regular blogging, responding to comments, making posts, getting involved in discussions, answering 50 plus emails a day and just doing what one does. We went to see the movies “Eye in the Sky” which was very good and “Mr. Right” which wasn’t and also wrote and posted the reviews. We ate at a couple of new restaurants like the Cuban/Mexican Fuego Latino, good, the coal pizza Anthony’s, not, the Bamboo Asian, just okay, along with a few goodies but oldies like Denny’s, Subways and the Quarter Deck. Still have to write and post the reviews of the new restaurants. Needless to say there were also the weekly trips to The Dollar Tree, Winn-Dixie plus stops at CVS and picking up my laundry at the cleaners. I went to the hand surgeon and he said the finger is healing well and though I still haven’t looked at it while he was changing the bandage—don’t laugh—but I had Allen take a picture of the bare finger and I am hoping to work up the courage to look at it that way. I do have to change the bandage every day and put some medical cream on it every day so-o-o-o-o-o time to bite the bullet. I go back to see him on Friday. As busy as last week was this coming week—well 20 days—I will have Allen’s car so you know I will be running around and finding ways to spend money I don’t have and, hopefully, getting in trouble! P.S. I changed the finger bandage, put the medical cream on it and a new bandage so I guess I am not the wuss/wimp I thought I was!